“The Moon Remembered, But You Forgot.” Words by Frank Eyton, music by Noel Gay. Composed for the comedy film Let’s Be Famous (1939). Recorded by Elsie Carlisle with orchestral accompaniment under the musical direction of Jay Wilbur on August 4, 1939. Rex 9610 mx. R3786-1. 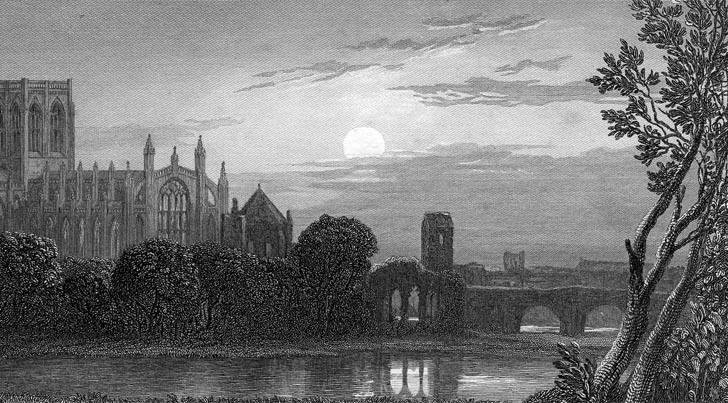 “The Moon Remembered, But You Forgot,” from the British comedy film Let’s Be Famous, was composed by Frank Eyton, an English popular lyricist most famous for having contributed to the words of “Body and Soul,” and Noel Gay, a prolific composer who also wrote such popular hits as “The Sun Has Got His Hat On” and “Lambeth Walk.” Its singer describes an outdoor anniversary rendezvous to which her partner does not show up. Left all alone in the presence of the evening moon, she engages in the pathetic fallacy, attributing to the moon human faculties, qualities, and emotions: memory, patience, certainty, and regret. Elsie Carlisle applies her best sincerity and pathos to this song on the first record she made for Rex Records (1939-1942). Rex was the last label that she was signed to, and it was there that she was reunited with musical director Jay Wilbur, who had played the same role in her career in the late 1920s and early 1930s, at Dominion, Imperial, and Eclipse. This was also the last record that Elsie made before war broke out in Europe. 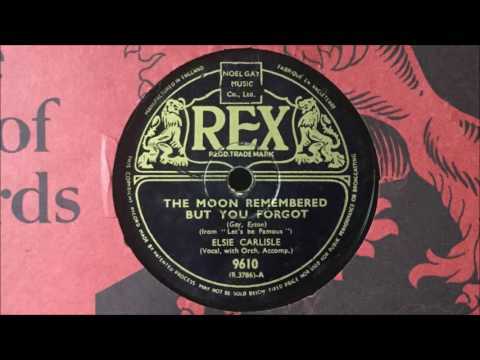 “The Moon Remembered, But You Forgot” was also recorded in 1939 by Leslie “Hutch” Hutchinson, Maxwell Stewart’s Ballroom Melody, Lew Stone and His Band (with vocalist Sam Browne), and Betty Driver. “Body and Soul.” Lyrics by Edward Heyman, Robert Sour, and Frank Eyton, with music by Johnny Green (1930). 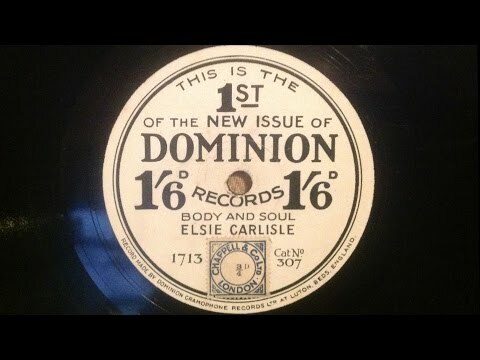 Recorded by Elsie Carlisle under the musical direction of Jay Wilbur in London c. early March 1930. Dominion C307 mx. 1713-1. In 1929, American composer Johnny Green got together with lyricists Edward Heyman, Robert Sour, and Frank Eyton to write a number of songs for British actress Gertrude Lawrence to sing on the London stage. One of them, “Body and Soul,” was to become a jazz standard par excellence. Lawrence, to her credit, recognized the inherent merit of the song and bought a share in it before going on to introduce it on the London stage and sing it on the radio, where it was heard by British dance band greats Jack Hylton and Bert Ambrose. Their renditions caught the attention of the public and of bandleaders, singers, and instrumentalists alike. After a spring fever of “Body and Soul” in London, recording of the infectious tune subsided for the summer and then resurged in America. In mid-October the song appeared as part of the Broadway revue Three’s a Crowd and was performed and later recorded by Libby Holman. 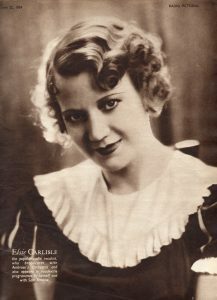 Elsie Carlisle sang many torch songs early in her recording career; unrequited love was a theme as much in vogue then as it is now, and Elsie’s delicate, sometimes quavering voice was a suitable vehicle for conveying pathos. Her March 1930 “Body and Soul” stands out from the rest because of her especially touching rendering of its mesmerizingly sad motifs. It might seem amusing that this recording is paired on its flip-side with the ribald “My Man O’ War,” which is a sort of sublime, extended series of sexual double entendres, but there is something a little gritty, too, about the lyrics of “Body and Soul” and the intensity with which Elsie expresses them. “Body and Soul” had been recorded in early February 1930 by Jack Hylton and His Orchestra (with vocalist Pat O’Malley, in a Billy Ternent arrangement). Later that month Hylton’s group would do a longer “concert arrangement” of “Body and Soul,” also with O’Malley. Soon after, Ambrose and His Orchestra recorded two takes of the song with Sam Browne; Ambrose and Browne would go on to issue two more versions of “Body and Soul” in 1933. The Four Bright Sparks made a recording with singer Betty Bolton that was never issued, but their take with Lou Abelardo was. Other February versions were done by Arthur Roseberry and His Dance Band (Harry Bentley, vocalist) and Bidgood’s Broadcasters (with vocalist John Thorne). In March, in addition to that of Elsie Carlisle, there were British renditions of “Body and Soul” by Spike Hughes, Jack Payne and His Band (an unissued take with vocalist Jack Plant), Hal Swain and His Band, Marie Burke, Herman Darewski and His Famous Melody Band, and Gracie Fields. As the spring went on, versions were made by Pete Mandell and His Rhythm Masters (three takes, including two with Jack Plant), Carroll Gibbons (on the piano, accompanied by violin and saxophone), Nat Star (as Bert Maddison and His Dance Orchestra, with vocalist Sam Browne), Jack Leon’s Dance Band (Jimmy Allen, vocalist), and Alfredo’s Band (with Sam Browne). From America, starting in September 1930, we have an unissued take of “Body and Soul” by Helen Morgan. Leo Reisman appears to have been quite fond of the song, and issued three recordings, one with Don Howard, one with Frank Luther and horn player Bubber Miley, and one with Frances Maddux. There were also records by Fred Rich and His Orchestra, Ruth Etting, Annette Hanshaw, Ozzie Nelson and His Orchestra, Louis Armstrong and His Sebastian New Cotton Club Orchestra, Paul Whiteman and His Orchestra (with vocalist Jack Fulton), Seger Ellis, Libby Holman, and Vee Lawnhurst (accompanying herself on the piano, of course).